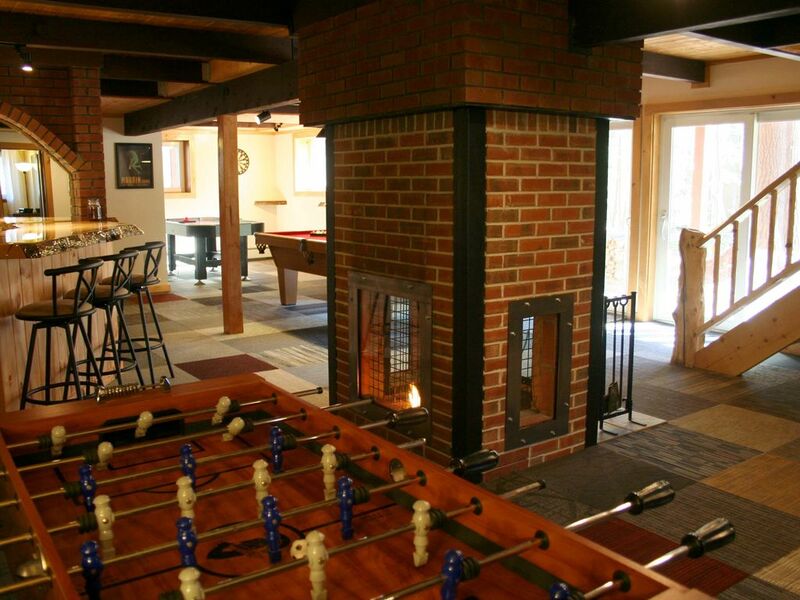 Pine Brook Lodge is a spacious 9 bedroom / 16 room / 5 bathroom vacation house available year-round. There are plenty of activities within for all ages including a large game room (remodeled in 2016) with an 8' Olhausen slate pool table, a professional air hockey table, dart board, foosball, flatscreen TV, fireplace, and wet bar. Our house has 3 TVs with cable, game room, living room, TV room, playroom, plenty of board games & books, 2 fireplaces, a dry sauna and free wifi access. Each bedroom has a fan & CD player / dual alarm clock. Outside there is parking for six cars, a landscaped front yard with sprinkler system and a small back yard adjacent to the brook with picnic tables. There is a front porch, a front balcony and a back deck with a gas grill. Child friendly, it includes a baby gate, crib, pack n play, booster seat and high chair. Please note: Pine Brook Lodge is strictly no parties, no smoking and no pets. Lower Level: The lower level has double sliding doors to the back yard & brook off of a the game room (8' Olhausen pool table, 7' air hockey, foosball, darts, fireplace, cable TV, wet bar w/fridge/freezer & sink). Other rooms on this level include laundry room (large washer / dryer), TV room w/flatscreen TV, sauna, twin bedroom & a full bathroom. Main Floor: Enter from our front deck into the main living area. This level includes the kitchen (granite counters, fridge with filtered ice/water, convection oven, glass top stove, microwave, toaster over, blender, coffee maker, dishwasher, disposal), dining room (seats 16 + highchair), living room (42 inch flatscreen TV, DVR, DVD, stereo & phone with answering machine), central fireplace viewable from all 4 sides, king master bedroom, queen bedroom, twin bedroom, full bathroom & a large covered back deck with gas grill. Top Floor: The upper level has a long hall with double skylights overlooking the living room. On this floor are a reading area, queen master bedroom, queen bedroom, two double bedrooms, twin bedroom, playroom & full bathroom. We offer deeply discounted tickets to various area activities. Winter months: ski and tubing tickets to Mount Cranmore, Black, Attitash and Wildcat mountains. Summer months: zip lines, gondola rides, both Attitash and Cranmore outdoor parks including water slides, mountain coasters, aerial adventure parks and more. We also offer discounts at the Cranmore Family Fitness Center (gym, fitness classes & more). We are from the Boston area and have been visiting North Conway for many years for family vacations. We have a daughter, and travel with her often. She is just now learning to ski down the road at Cranmore. We had a smaller property, but saw a need for larger gathering spaces. When we bought this house it had to be completely redone, but it was well worth it. Pine Brook Lodge is in such a great area. Pine Brook Lodge is across the street from hiking trails, 1/4 mile from skiing and 1/2 mile from the center of town. It could not be more convenient. With 9 bedrooms and 5 baths, it is perfect for large family groups hiking, skiing, or just visiting StoryLand in the summer time. Pine Brook Lodge is across the street from hiking trails, 1/4 mile from skiing and 1/2 mile from the center of town. It could not be more convenient! With an entire game level kids of all ages are sure to have a good time. We even have a small playroom for the little ones. We just remodeled the lower level in 2016, and had a bear carver create custom carvings and stairs throughout the three stories. Mount Cranmore is a 2 minutes walk, they offer skiing, snowboarding and tubing. We offer discounted passes. We have 2 steps up to get in the house. The main level has 2 bathrooms, 3 bedrooms, kitchen, dining and living areas, so no major stairs are necessary. We offer discounts at a local indoor swimming pool. Please inquire for details. Other amenities include: DVD players; cribs, highchair, baby gate, pool table, air hockey, wet bar, PlayStation 2. Discounted mountain coaster, tubing and ski passes for Attitash Mountain Resort, Mount Cranmore and Wildcat Mountain! We also offer discounts at the Cranmore Family Fitness Center (gym, fitness classes & more). This place made the trip! Great for a large group and super close to the mountain! I would rent again for sure! Great stay with very responsive host! We had a large group with young children and had a great stay. The gates at each set of stairs was so helpful!! Katie was very responsive to any questions or issues. Thanks for a great weekend away with friends!! Perfect location, great home for a multi-family vacation! We stayed at Pine Brook Lodge for a multi-family weekend ski vacation. The location, just outside downtown North Conway, was the best. We originally looked at a few homes that could fit our group. Throughout the selection process the owners we extremely helpful and gracious when we had questions.. The house had everything we could possibly need. One family had an infant and the house had a crib, pack-n-play as well as a highchair! The kitchen had every possible pot, pan and utensil you could need to cook meals for large group. We couldn't have asked for.a better setup. It was so nice to have everything we needed when we got there. Before, during and after our stay, Katie and Tony were in constant communcation and checked in to make sure we had all the info we needed. I've never had as much support from an owner as with Pine Brook lodge. They were truly awesome! All in all it was a perfect vacation in a great home. Our group was unanimously happy with Pine Brook lodge. We would absolutely book another stay with them and highly recommend the home for anyone looking to stay in North Conway with friends and family! Great family vacation house ! We ranged in age from 15 to 82, and every one of us had a wonderful time. The game room downstairs is fantastic, and everything upstairs was very comfortable. Katie (the owner) was a pleasure to talk to whenever we had a question, and was very patient and helpful. We will certainly consider renting this house again, when we are more sure of everyone's future plans. Katie was so sweet to deal with. The house was perfect and we had a blast playing air hockey and pool, while others sat at the bar and cheered us on. Beautiful location and so close to all of the shopping and restaurants! I will definitely be renting from her again! I had a family get together / vacation with 5 generations of family and we all had plenty of space for everyone. All the bedrooms were in great shape and every single person slept so well that all of us slept in over 1 hour each day. It was so relaxing and truly was an amazing vacation. The game room downstairs is unbelievable with all the games down there. We consistently had people down there playing something. The location of the house to all the local activities was awesome as we barely had to drive 20 minutes to any of the things we did. The house was wonderful and so are the memories it gave me and my family. I would definitely return again and really hope that we do! Situated just 1/2 mile from the Village of North Conway and only 1/4 mile from Mount Cranmore, this large Brookside home is convenient for all north country activities: skiing (Attitash / Bear Peak - 10 min & Wildcat - 15 min), StoryLand, hiking, climbing, swimming, canoeing and outlet shopping. The North Conway area features attractions for the whole family including winter sports, golf, mini-golf, alpine and water slides, mountain biking, and scenic train rides as well as fine dining, theater and night life.